﻿ International Presence | Velyen - Equipamiento de taller. Fabricante de elevadores. We are the first Spanish company in manufacturing and marketing of lifts. 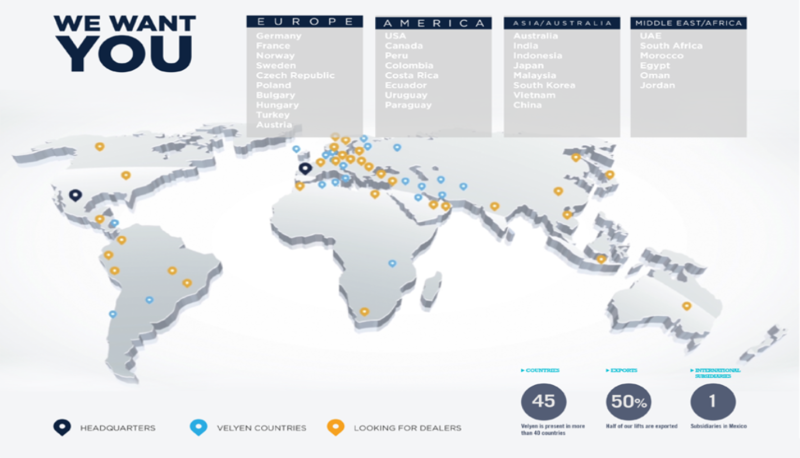 We export our products to more than 40 countries and have a wide network of distributors throughout the world. Velyen looks after your future and has a flexible spare parts logistics guaranteeing you an express service in less than 72 hours, regardless of where you are in the world. The experience gained in spare parts logistics has enabled Velyen to have the knowledge to optimize time, itineraries and logistics management systems in order to meet your expectations as quickly as possible.